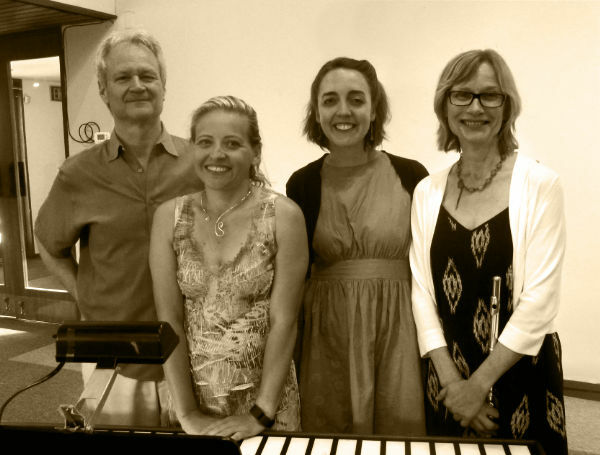 The Bespoke Consort will present invigorating concerts of crossover chamber music sans boundaries including neo-Baroque escapades, Impressionistic tone poems, original tangos, quirky musical novelties, Alberto Ginastera’s Estancia ballet suite, plus rollicking arrangements of Erik Satie, Leroy Anderson, Rising Storm and Birdsongs of the Mesozoic chestnuts. A pleasant and uplifting time is guaranteed for all! Saturday, May 4 @ The Lilypad 1353 Cambridge Street (Inman Square), Cambridge MA ❖ www.lilypadinman.com 5:00–6:30 $10 Please join the musicians afterwards for a dinner across the street at the S&S Restaurant. 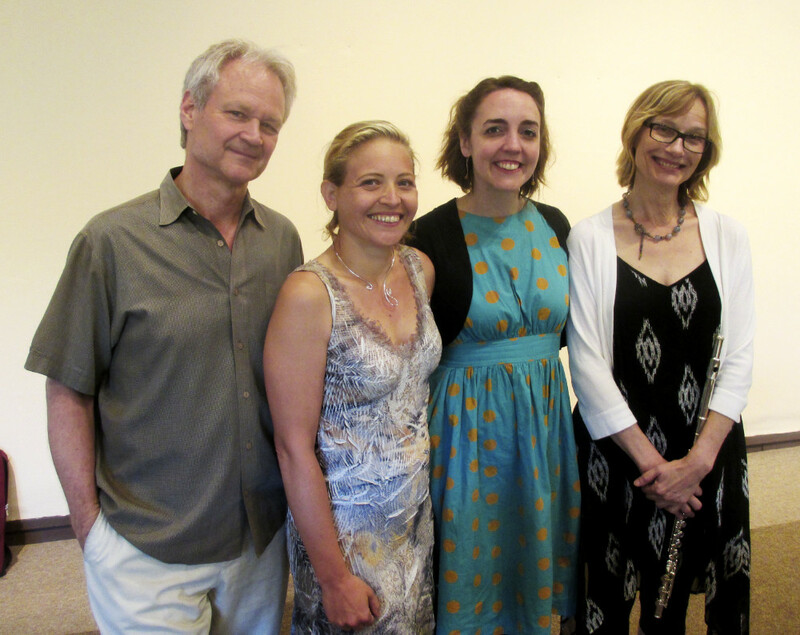 This program is supported in part by a grant from Associated Chamber Music Players. Saturday, June 1 @ First Unitarian Universalist Society of Middleboro	25 South Main Street, Middleborough, MA 02346 7:30 PM Free–donations accepted. ❖ uumiddleboro.org This program is supported in part by a grant from the Middleborough Cultural Council, a local agency which is supported by the Mass Cultural Council, a state agency. * Please inquire about availability if you are interested in attending either of the private events. 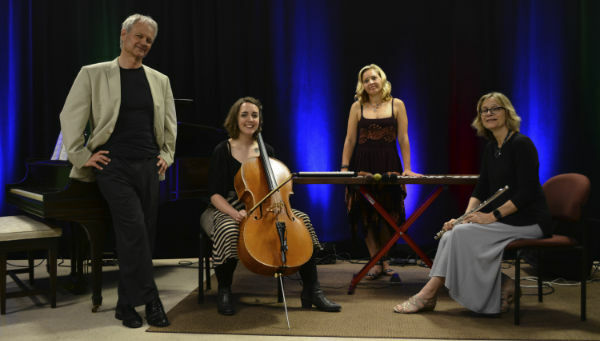 In the late 1990s, Lindgren’s Boston-based chamber rock quartet Birdsongs of the Mesozoic invited Flutter Effect’s Vessela Stoyanova and Valerie Thompson to perform with them on a concert at the Berklee Performance Center. Not long after, Vessela and Valerie formed the duo Goli Music which opened for Birdsongs on multiple occasions. 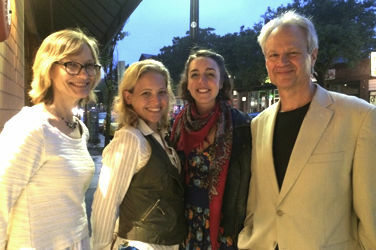 In the mid 2000s, Lindgren collaborated with the Goli gals in various ensembles that provided music for choreography at the Dance Complex in Cambridge, MA. 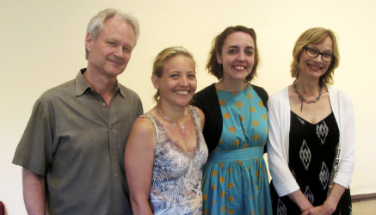 In the spring of 2014, Lindgren was invited to perform with an ensemble at the Shalin Liu hall in Rockport, MA, and invited Ves and Val to play with Birdsongs’ woodwind player Ken Field. In 2016, Lindgren produced a series of concert to promote his new CD, Bespoke (Albany Troy 1632). He recruited flutist Thomasine Berg along with Ves and Val for his new quartet, The Bespoke Consort. The ensemble’s magnetic and eclectic repertoire consists of original chamber compositions by Lindgren along with arrangements of works by Alberto Ginastera, Brian Wilson, Erik Satie, Raymond Scott, Leroy Anderson, and Birdsongs of the Mesozoic. Erik Lindgren and The Bespoke Consort prove that art music can be both elevating and entertaining; this is one ensemble that can swing and sway, rock out, dazzle you with its virtuosity, and surprise you with a truly unique and rollicking musical vision. Thomasine Berg earned a Master of Music in flute performance from the University of Michigan, Ann Arbor, and was a member of the Flint (Michigan) Symphony, the Conductor’s Symposia Orchestra of the Vienna (Austria) Conservatory, the Opera Festival Orchestra of Las Palmas, Canary Islands, and the Blue Hills Chamber Players in the Boston area, in addition to teaching flute and performing as a freelance musician. She took a mid-career detour into the world of newspapers, landing at the Boston Globe as editor of classical music and visual arts, and left the Globe in 2013 to get back to making music. Vessela Stoyanova is widely respected performer, composer, and educator, and is a triple threat on the Boston music scene. Born and raised in Bulgaria, much of her original music is inspired by the folk music of the Balkans, which has lent her a unique voice especially given her background as a classical percussionist and connoisseur of a variety of contemporary music styles. 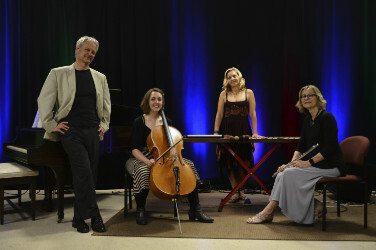 Vessela’s own compositions have been recorded by numerous ensembles and performed at major New England-area venues including the Berklee Performance Center, Jordan Hall, The Loeb Drama Center at the American Repertory Theater, Mechanic’s Hall in Worcester, as well as at many smaller venues around the U.S. and Europe. 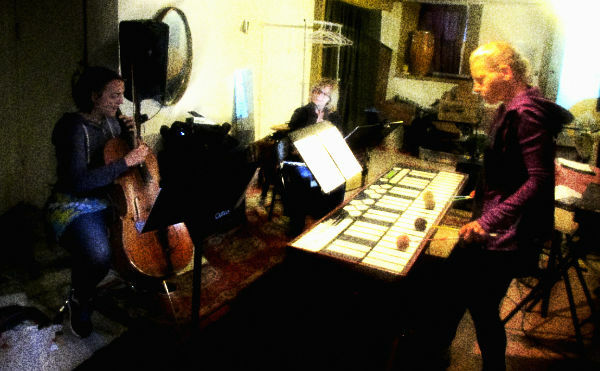 As a performer Vessela combines virtuosic mallet technique with the world of electronics, especially via her prototype instrument the “Marimba Lumina” — a sophisticated mallet MIDI controller. Currently she performs and writes for two projects: Bury Me Standing (a gypsy dirge-core band) and Goli (a modern chamber music duo), both of which she co-founded. Vessela recently joined the Jazz Composers Alliance and has been a featured soloist for a number of their concerts. Vessela holds a master’s degree in Contemporary Improvisation from the New England Conservatory of Music. She is now a faculty member at the Berklee College of Music, where she teaches Harmony and Marimba. Valerie Thompson is a native of Kansas City, MO and began her classical cello studies at the age of ten. She is both a graduate of Berklee College of Music with a B.M. in music performance, and New England Conservatory of Music with a M.M. in contemporary improvisation. She has performed in the Czech Republic as a participant of the Ameropa Chamber Music Festival, at the Banff International Youth Symphony Festival in Alberta, and the Cathedral of St. John the Divine with the Berklee String Orchestra. Valerie has enjoyed an active freelance career in the Boston area with chamber performances, recording session work, and sharing the stage with such notable artists as jazz pianist, Fred Hirsch; rock-icon, Amanda Palmer; multi- media artist, Christopher Janney; and with pop-chamber ensemble, Vitamin String Quartet. Erik Lindgren received his BA in Music from Tufts University in 1976 where he worked with T.J. Anderson. In 1975–’76 he spent his junior year abroad in London studying composition at the Guildhall School Of Music with Alfred Nieman and piano with Birgette Wild. Lindgren received an MA in music composition and piano performance from The University of Iowa in 1977 where he studied with Donald Jenni, Richard Hervig, and Peter Lewis. As a contemporary classical composer, Lindgren has a catalog of over seven dozen compositions, ranging from solo piano pieces to chamber music to orchestral works. In 2012, the Georgia Symphony Orchestra commissioned Lindgren to write Extreme Spirituals, a 25-minute work for orchestra and bass baritone soloist which was premiered October, 2012 in Atlanta, and performed by The Brockton Symphony Orchestra in April, 2017. In 2014 and 2015, he was commissioned by the Chamber Orchestra of Boston to arrange two original tangos. 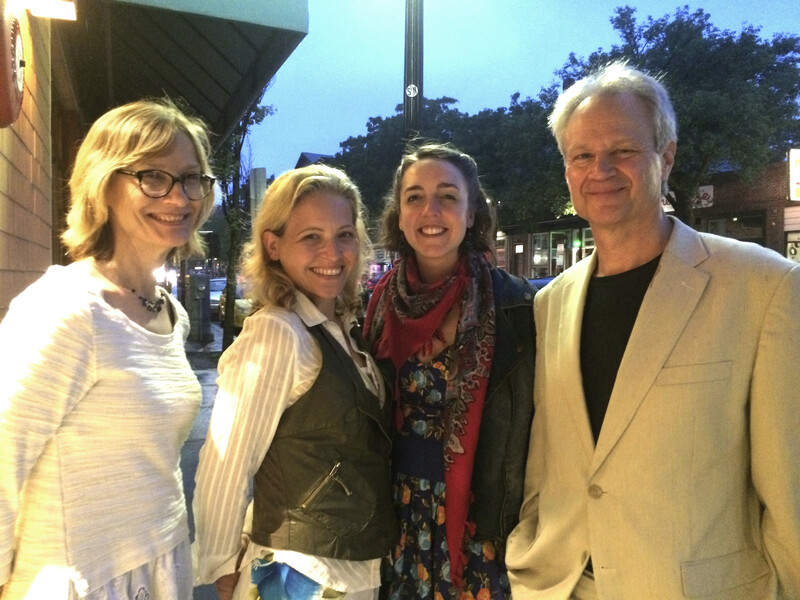 Lindgren was also artist-in- residence at Tufts University in September, 2014 which culminated with a performance of his chamber works. In 2016, Lindgren released his third solo chamber CD Bespoke on the Albany Records label. For 35 years, Lindgren has run the ARF! ARF! label which has released over six-dozen archival cds documenting ’60s Garage/Psychedelic Rock and “Outsider Music.” ARF! ARF! has issued four cd retrospectives by his ’80s eclectic studio group Space Negros. Lindgren has also produced over one hundred records for such diverse artists as Willie Loco Alexander, the Turbines, the Cynics and Ed “Moose” Savage and his Litany of Complaints. In 1978, Lindgren established Sounds Interesting Productions, a commercial recording studio and music production company. National and regional credits include original scores for all three networks, PBS, Eastpak, Boston Globe, Basketball Hall Of Fame, Jordan Marsh, Polaroid, Prentice-Hall and the Christmas Tree Shops. Since 1980, Lindgren has been a founding member of the new music ensemble Birdsongs of the Mesozoic that Billboard Magazine described as “a mesmerizing venture into the space age jungle.” The quartet has toured extensively throughout the United States, Canada, and Europe, and has released 11 CDs for the Rykodisc, Cuneiform, and Ace of Hearts labels. The group has collaborated with Duplex Planet editor/NPR correspondent David Greenberger on 1001 Real Apes, and Atlanta bass baritone Oral Moses on Extreme Spirituals. Fee: Regional dates are negotiable. Block bookings are encouraged and workshops are available.